↑ Tanika Sarkar, Sekhar Bandyopadhyay. Calcutta: The Stormy Decades. Taylor & Francis. पृ॰ 441. आई॰ऍस॰बी॰ऍन॰ 1-351-58172-4. ↑ Tsugitaka, Sato (2000). Muslim Societies: Historical and Comparative Aspects. Routledge. पृ॰ 112. आई॰ऍस॰बी॰ऍन॰ 0-415-33254-0. ↑ Bourke-White, Margaret (1949). Halfway to Freedom: A Report on the New India. Simon and Schuster, New York. ↑ Das, Suranjan (2012). 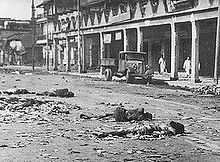 "Calcutta Riot, 1946". प्रकाशित Islam, Sirajul; Jamal, Ahmed A. Banglapedia: National Encyclopedia of Bangladesh (Second संस्करण). Asiatic Society of Bangladesh.